What do "High" by The Cure, "Metropolis" by The Church and Duran Duran's "The Wild Boys" have in common? 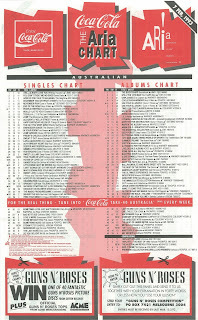 They're all, somewhat surprisingly, the highest charting single by the bands in question in Australia. But that sometimes happens. 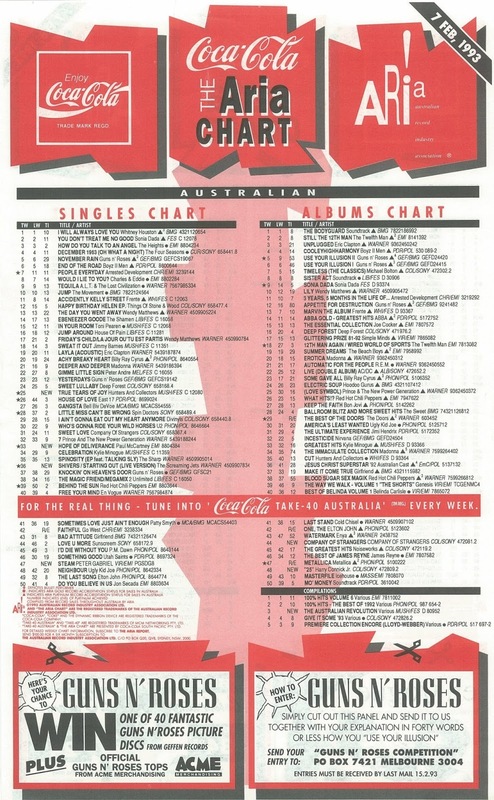 For whatever reason, a band doesn't score biggest with their most famous or best song - and it's something we saw with one of the new entries on the ARIA singles chart from this week in 1993. The best charting single of Whitney Houston's career was still at number 1 this week in 1993. "I Will Always Love You" had now spent eight weeks on top. They took their name from a Monty Python sketch and this song from their third album provided Toad The Wet Sprocket with their US breakthrough, reaching number 15. This local acid jazz band's music was inescapable in inner city cafes and shops during the mid-'90s - and this was the independently released EP that started it all off. I can see why Peter Gabriel didn't kick off the Us campaign with this single. Musically and visually, it's pretty much where he left off in 1987 with "Big Time" and earlier hit "Sledgehammer", and so it might have seemed like he hadn't made any artistic progression in the intervening years. Coming as it did after the more subdued "Digging In The Dirt", however, "Steam" felt like a throwback rather than a repetition. Naturally, the busy music video, again directed by Stephen R Johnson, was a Grammy Award and MTV VMA winner. "Think", the first single from The Screaming Jets' second album, Tear Of Thought, had missed the top 50 entirely in late 1992, but the Newcastle band got things back on track with this remake of a song originally sung by Nick Cave. Released in 1979, "Shivers" had been the second single by post-punk band The Boys Next Door, who would change their name the following year to The Birthday Party (and feature future members of Nick Cave And The Bad Seeds in their line-up). One of The Jets' softer offerings, the cover version matched the peak of their last top 20 hit, the Living In England EP, but fell some way short of their biggest single, "Better". "Shivers" was backed by a live version of All For One album track "Starting Out", although the link above is to the original version, not the live recording (which I can't find online). A decade earlier, Paul McCartney had still been a major chart force, racking up five top 10 hits in the first half of the '80s (with and without Michael Jackson and Stevie Wonder). By 1993, new music from the ex-Beatle was no longer the event it once was, and this Latin-tinged lead single from Paul's ninth solo studio album, Off The Ground, did no better than 1989's "My Brave Face" in reaching the top 30. The album, at least, returned him to the top 10 for the first time since 1987 compilation All The Best!, but this would be Paul's last top 50 singles appearance for more than two decades. All of this week's debuts are less remembered singles by the artists responsible, but in the other three cases, the acts had much bigger hits. For Hunters & Collectors, this ballad fourth single from Cut ranks as their highest charting song of all time. Yep, higher than "Say Goodbye", "Do You See What I See", any of the releases of "Throw Your Arms Around Me" or the song that would follow as Cut's fifth single. Contributing to the success of "True Tears Of Joy" - and its rapid rise this week after struggling in the 80s for a few weeks - was the fact that the CD single was another of those massively discounted releases, retailing for as little as $1. That's possibly why the song, despite taking the band into the top 15 for the only time in their career, hasn't ended up as an Aussie rock classic like those other H&C tracks. Next week: two acts often wrongly described as one-hit wonders debut with their second top 50 singles - one much bigger than the other. I remember being really annoyed that Peter Gabriel's singles from the "Us" album didn't chart very high and therefore were only played by Rage in the small hours, way to early for me to get up and tape them. The band name Toad the Wet Sprocket screams 'American' to me. I remember the band name, but not the song. I was expecting it to be more like Spin Doctors or Hootie & The Blowfish than it sounds. It's not bad, but sounds like it could have later been used on a Dawson's Creek or Party of Five soundtrack. DIG are another group whose name I recall, but not really the music, other than the genre. 'Steam' was decent, but the video was quite exceptional; though probably not quite as good as that for 'Digging In the Dirt'. I loved the "you know your culture from your trash" lyric. I was thinking 'Shivers' might have also been a discounted single (hence it doing much better than the previous few), but can't find evidence of it from a quick look on eBay. 'True Tears of Joy' is possibly my favourite Hunters & Collectors single. I like the general melancholic mood it conveys, despite its title. But it did seem suspicious seeing it suddenly catapult to #25 after having been around for months. Still, it rose, so someone must have bought it - discounted or otherwise. Toad The Wet Sprocket's "Little Heaven" was featured on the Buffy: The Vampire Slayer Soundtrack (the movie with Luke Perry, circa 1992) as well as "Crazy Life" on the Empire Records Soundtrack, circa 1995. Like the Dave Matthews Band, Toad were rather big in America but never crossed over to Australian radio. It was the start of the grunge revolution. They just didn't fit in.